﻿Cherno Okafor Ms. Kilbourn NDW4M7 September 19th, 2012 Internal Assessment HL (Field Research) Step 1 I have decided to opt for an issue-based approach within a greater context based setting, and investigate some of the social and cultural aspects such as language and communication, customs, and arts of the modern airport, and how it is experienced by passengers. I am focusing on Toronto Pearson International Airport Terminal 3 and while doing this, I will somewhat be attributing my own experiences from other airports I have come through on various trips throughout my life. 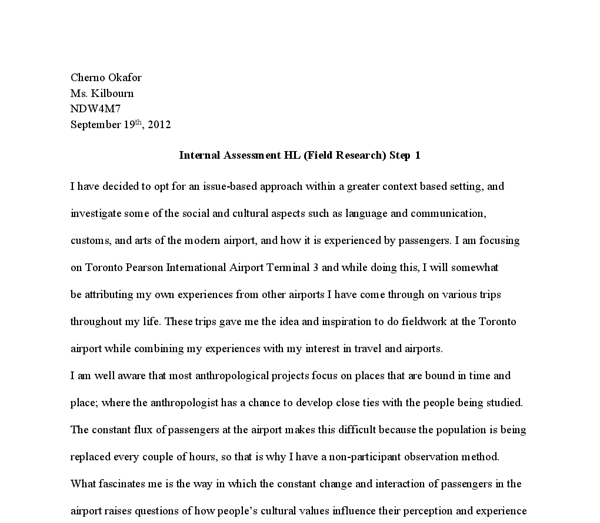 These trips gave me the idea and inspiration to do fieldwork at the Toronto airport while combining my experiences with my interest in travel and airports. I am well aware that most anthropological projects focus on places that are bound in time and place; where the anthropologist has a chance to develop close ties with the people being studied. The constant flux of passengers at the airport makes this difficult because the population is being replaced every couple of hours, so that is why I have a non-participant observation method. What fascinates me is the way in which the constant change and interaction of passengers in the airport raises questions of how people?s cultural values influence their perception and experience of movement and transit, and how during air travel, time and place are both compressed and interlinked in a complicated travel network system that works on a regional, national, and global level. ...read more. However, this is unlikely to be the case since there is a constant flux of passengers at the airport at the same time and no one really has time to pay attention to one person in the entire terminal. In addition, too much subjectivity may ruin my whole fieldwork, so I will try to limit my subjectivity this time and focus more on the present situation. Then, there is always the possibility of imponderabilia where I note my first impressions of the setting to maximize potential bias. I also need to examine my assumptions carefully, hence, using interviews will help me draw closer to people and decrease the possibility of being biased for that matter. Using the non-participant (first hand) observation technique is more susceptible to biases and assumptions but now that I have chosen a specific aspect of the airport, the socio-cultural aspect of language and communication (Observation) and values/customs/experience (Interviews), it puts everything into perspective for me and enables me to observe accordingly. 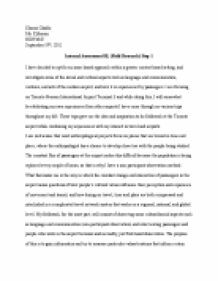 Cherno Okafor Ms. Kilbourn NDW4M7 October 18th, 2012 Internal Assessment HL Stage 2 My rephrased research question revolves around the same socio-cultural concept, but involves two parts. The first part is for my first-hand observation: To what extent do socio-cultural aspects, such as language and methods of communication, exemplify the ways in which families/friends and departing/arriving passengers experience travel and airports? ...read more. The major theme I will be addressing is Individuals, groups, and societies and relationships as well as Idealist (passengers are guided by individual ideals) vs. Realist (those governed by practical considerations). Also, Particularist (some passengers have a particular approach; an exclusive interest in their own group) vs. Universalist (passengers with a universal interest). Basically, this whole system involves an interaction between the subculture of passengers with their families/friends, and employees. Together, these subcultures form an airport culture which everyone accepts. Finally, some of my questions I chose to ask people in my interview are unnecessary questions that do not pertain to my intent of this fieldwork. Questions such as: what do you do for a living? Nationality (however I will now change this to ethnicity since anyone of any ethnicity can have any type of nationality and that does not affect cultural values. Also asking people to explain what I might explain in my internal assessment such as how the airport is a microcosm of the city it is situated. Another unnecessary question is: How do people see the future of travel and airports 10 years from now. This has nothing to do with what I am trying to investigate and achieve which are the socio-cultural aspects as mentioned above. Also, there is the one involving people to list the airports they have traveled into/out of or transferred at and the type of planes, again distancing away from the purpose of this fieldwork. ...read more. Another cognitive or mentalist orientation is symbolic anthropology. It is an extension of culture and culture patterning, meaning that symbolic systems have preservation functions or psychological functions. For example, a system that has been treated in its own light, and isn't related to a social, psychological or biological system, derive more meaning from biological facts of kinships. Today, the status of nations and rising powers is affected by more than just geography. There are complex economic, political, and social networks that determine a nation-state's power. Capitalism and Christianity are a large part of Western civilization and the Western powers of today. This is the same belief that inspires Roman Catholics to discourage divorce as well as remarriage as seen in Figure 2. However, remarriage is not an issue for other Christian denominations such as Lutherans, as they enforce slightly different Biblical passages to lead their congregation. However, this is a contentious topic as the decision of substantiation is often arbitrary. The International Covenant on Civil and Political Rights, Article 26, does promise to protect all individuals from discrimination on the grounds of language. Following that, Article 27 declares, ?minorities shall not be denied the right? to use their own language?. 88% of new record releases are foreign content. Foreign films take about 95% of the screen time in our movie theatres. Foreign content makes up 61% of all English-language programming available on Canadian television screens, the vast majority of it American.? (2004) (Couture 2). These statistics put in perspective how dependant Canada is on other cultures content.